Inspecting your property for bees and wasps can be a proactive way of keeping your yard safe from unwanted stinging insects. It only takes a few minutes a couple of times a month to notice new nests and unwanted activity. Left untreated, wasps can quickly spread causing an infestation. Bees are very productive, and left unattended can establish a hive filled with honey that can result in property damage and expensive repairs. This time of year we begin getting a lot of calls for wasps. Actually, homeowners sometimes think they have bees, but we find yellow jackets instead. Recently, we have found multiple wasp nests in thick ground cover which gives wasps a perfect hiding place. If you can observe these stinging pests coming and going from thick foliage or ground cover, you just might have wasps. Eliminating one nest is not enough. Wasps will quickly multiply, and unlike honeybees, do not need an established hive to survive. Wasps are male and female, and it only takes one of each to create a new nest. 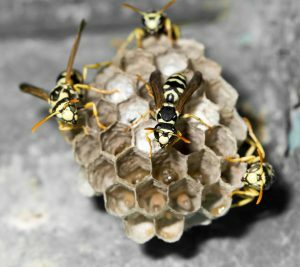 We prefer to treat wasp infestations in the early morning or late evening to insure that all pests are home when we remove the nest. To inspect your property for wasps, observe those ground cover areas for activity. In addition, walk your property inspecting roof lines, entry areas and window frames for nests. Wasps are carnivores, can be especially aggressive, and are able to sting repeatedly. Read more about wasps here. Given enough time honeybees can produce a good amount of honey within a couple of weeks depending on hive location and sheer number of bees. To prevent that from happening inside or around your home, a through property inspection is in order. Most residential properties can be inspected by the homeowner within a couple of minutes twice a month (especially in the spring & summer). What you’re looking for is basic – a lot of bees coming and going from one specific location. Don’t be fooled by honeybees on anything that is blooming. At certain times in the spring you may find hundreds of bees on the flowers pulling pollen or nectar (this does not indicate nesting). On stucco framed homes any ornamental pop out areas are infamous locales for nesting bees. Columns and vega beams or wherever wood meets stucco. A flat roof, parapet walls and scuppers (flat roof drains) are also favorite nesting spots. Take a step away from the home and scan your entire roof surfaces. Bathroom, kitchen and laundry room exhaust vents are a straight shot into the house. A/C units and hidden roof areas may require a ladder to view. Please, by all means, be safe. Read more about the unusual places bees build hives. If you locate bees or wasps on your property – Back Off! – And call ASAP Bee Removal for further instructions and free phone quotes. We have solution to your problem!